Background: The tyrosine kinase inhibitor, imatinib, used as a first line treatment in Chronic Myeloid Leukemia (CML) patients, may lead to resistance and failure to therapy. Novel combinations of imatinib with other drugs is a strategy to improve treatment efficiency. Objective: In this study, the antileukemic and apoptotic effects of a benzamide derivative XT5 and benzoxazole derivative XT2B and their combination with imatinib were investigated in imatinib-sensitive (K562S) and imatinib-resistant (K562R) CML cells. Methods: In vitro cytotoxicity was determined by MTT assay. Then, apoptotic effect of XT5 on CML cell lines was tested by Annexin V flow cytometry, caspase activation and RT-PCR. Docking calculation was performed using AutoDock Vina in PyMOL environment using AutoDock/Vina plugin for PyMOL. Results: According to our MTT assay data, XT5 indicated significant antiproliferative effect on cell lines, therefore we investigated apoptotic effects of XT5. 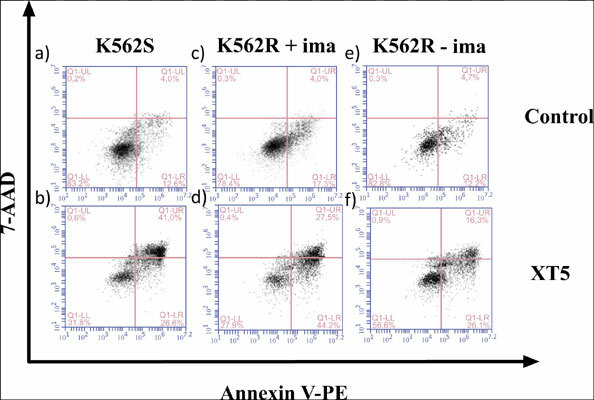 Treatment of K562 cell lines with a combination of XT5 and imatinib-XT5 increased cytotoxicity, the Annexin V binding and caspase 3/7 activation. In addition to apoptosis assays, we observed an increase in the expression levels of the pro-apoptotic (BAX, BAD and BIM) genes in XT5 treated K562R and K562S cells. Molecular modelling experiments showed that XT5 showed hydrogenbonding interactions with important amino acids of BCR-ABL kinase receptor; however XT2B did not show any hydrogen bond interaction. Conclusion: Our results indicate that XT5 could be a potential candidate to be used as a new anticancer drug and XT5 combination with imatinib as an alternate treatment strategy for overcoming imatinib resistance. Keywords: CML, K562, imatinib resistance, benzamide, apoptosis. Keywords:CML, K562, imatinib resistance, benzamide, apoptosis. Abstract:Background: The tyrosine kinase inhibitor, imatinib, used as a first line treatment in Chronic Myeloid Leukemia (CML) patients, may lead to resistance and failure to therapy. Novel combinations of imatinib with other drugs is a strategy to improve treatment efficiency.